Unlike Pigeon and Bugaboo Spire which are typically guided by one or two routes only, Snowpatch Spire has no ‘easy way up’ but offers several different routes in the 5.8-5.9 grade to choose from. Because of this, Snowpatch sees far fewer ascents. 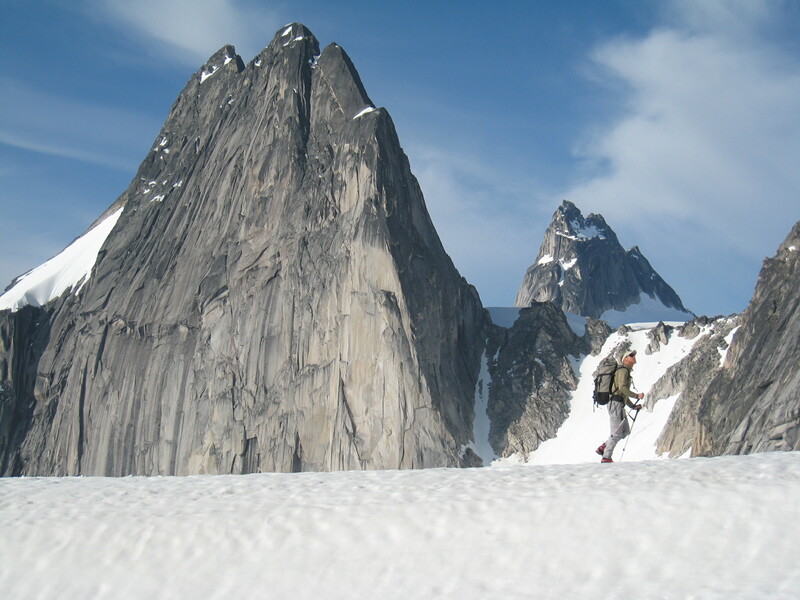 It was first climbed in 1940 and was the last of the Bugaboo Spires to be climbed. On the West face expect steeper terrain and more physical rock climbing and hand jamming than the other Spires. South East Corner (Snowpatch Route): Sustained 5.6, 17 pitches, grade IV. Where this climb lacks in technical difficulty, it makes up for it in length and complexity. The Snowpatch Route starts very close to the Kain Hut and traverses up and over the entire mountain. Descent is via the Kraus McCarthy rappel route. You are guaranteed no line ups on this intimidating face. A very cool and committing climb. A fit party of two can climb the Kain Route in 14 hours return trip from the Kain hut. Buckingham Route: 5.8, (mostly 5.6-5.7) 8 pitches, grade III. This is a good climb for a shorter day (such as the last day of the trip) or a warm up climb for the bigger Spires. It starts directly above the Bugaboo Snowpatch Col, is NW facing so typically colder, and does not reach the summit but gains a prominent shoulder above the Tom Eagan Wall. 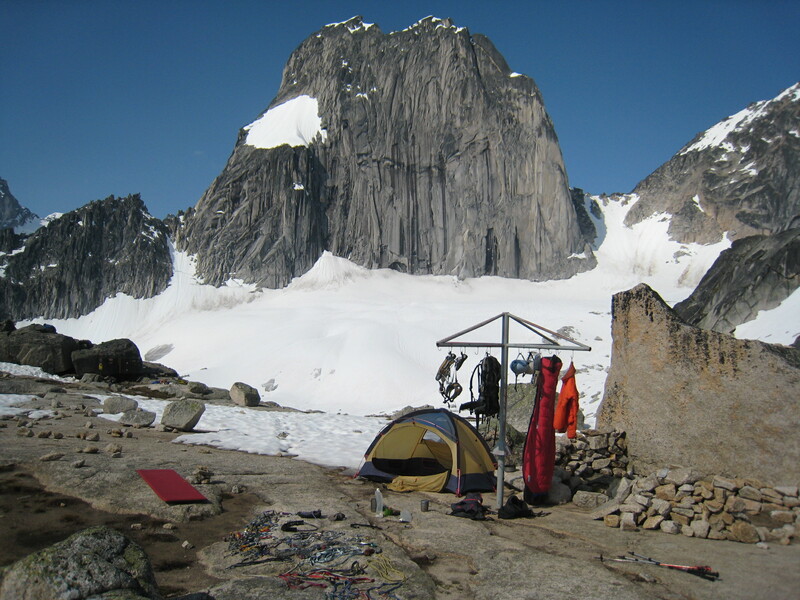 The bonus is boots and glacier gear can be left at the base as the route is rappelled. Kraus-McCarthy: 5.8, 8 pitches, grade III. Kraus and McCarthy were the best climbers from the Gunks when they did the west face of Snowpatch Spire. Originally rated 5.8, don’t believe it. It was a test-piece back in the day and has several moves of 5.9. The route ascends a mini amphitheater on the West Face with steep walls on each side and is also the designated rappel route for the mountain with brand new bolted stations every 30m. Because of this, your boots and glacier gear can be left at the base and it makes a great objective if the weather looks at all dubious. 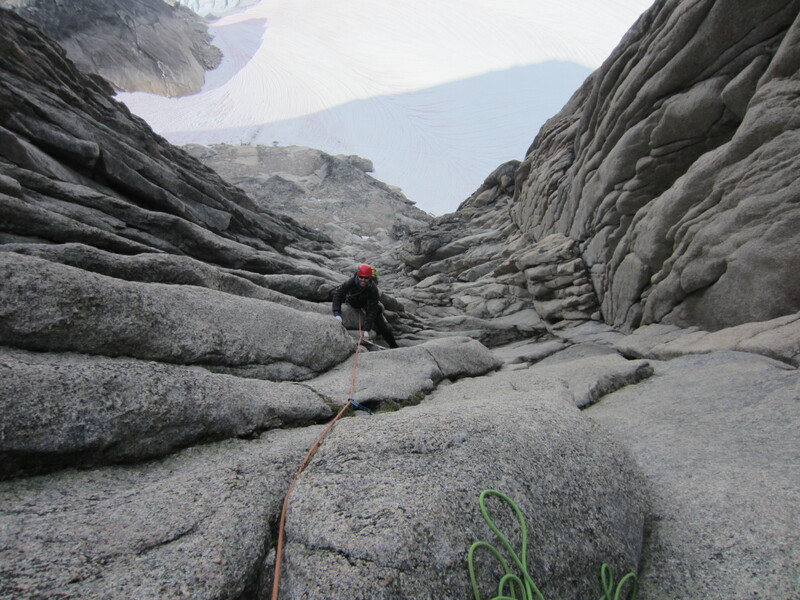 If you climbed the NE Ridge of Bugaboo and want to try something a little harder, this is a great option. A fit party of two can climb the Kraus-McCarthy Route in 12 hours return trip from the Kain hut. Surfs Up: 5.9, 8 pitches, grade III. Surfs Up has become increasingly popular over the years because its reputation of quality splitter cracks high on the SW ridge with amazing exposure above the Bugaboo Glacier. Being able to escape the shade of the West face once you gain the ridge is also nice if the temperatures are cool. Many parties have trouble with route finding at the start and get off route trying to locate the famous Surfs Up Ledge. Another Mega classic. A fit party of two can climb the Surfs Up in 14 hours return trip from the Kain hut. 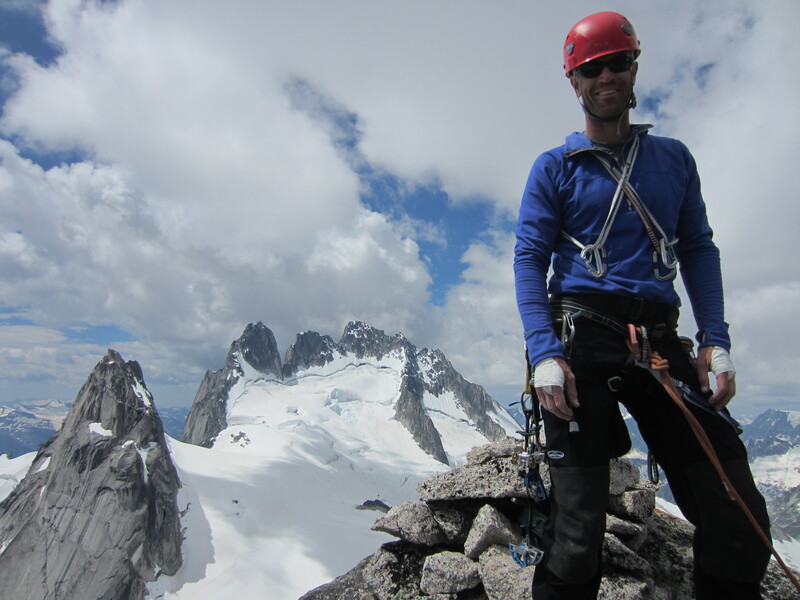 Pictured above is Rodney Green during a successfully guided ascent of Snowpatch Spire (Kraus-McCarthy) and on the summit in 2013.